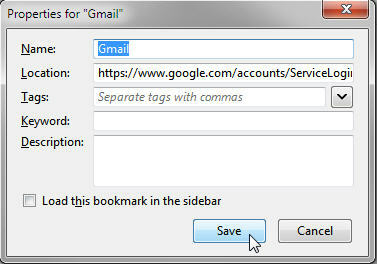 In Google Chrome, simply right-click on the bookmark and click Edit in the pop-up menu. Here you can either rename the bookmark or eliminate the title entirely. Here is what the Gmail favorite looks like with a shortened title, and without a title. And here is what my bookmarks bar looks like with more titles removed. In some cases the icon may be generic, or may not be distinctive enough for you to recognize what it is without the title, in this case the American Express icon is a bit too generic and I might forget what it’s for if I completely remove the title. Or if the website doesn’t have a distinctive favorite icon you might just see the generic browser shortcut icon. Other browsers have the ability to edit or shorten the bookmark favorites. In Firefox, right-click on the bookmark and select Properties. Here you can edit or delete the name. Internet Explorer is somewhat limited in its favorite bar customization. Here you can only select, Long titles, Short titles, or Icons only. Here in this screenshot you can see the long titles. 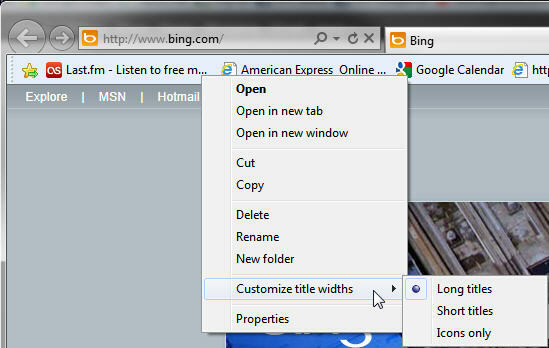 In Internet Explorer, right-click on a bookmark, click Custom title widths, then choose your option. And here is the Internet Explorer favorites bar with Short titles, and Icons only. This entry was posted on July 7, 2011, 10:42 pm and is filed under Tips. You can follow any responses to this entry through RSS 2.0. Both comments and pings are currently closed.